The North Sea ecosystem is degraded from multiple anthropogenic factors, and, according to the Marine Strategy Framework Directive, must be returned to Good Environmental Status (GES) by 2020. This degradation has manifested through alterations in ecosystem services such as resistance and resilience, transparent water, processing of nutrients, food production, and carbon storage and sequestration. These ecosystem services are linked to benthic functioning, changes to the extent and severity of which have been linked to the spread of industrialized trawling which began in the North Sea around 150 years ago. 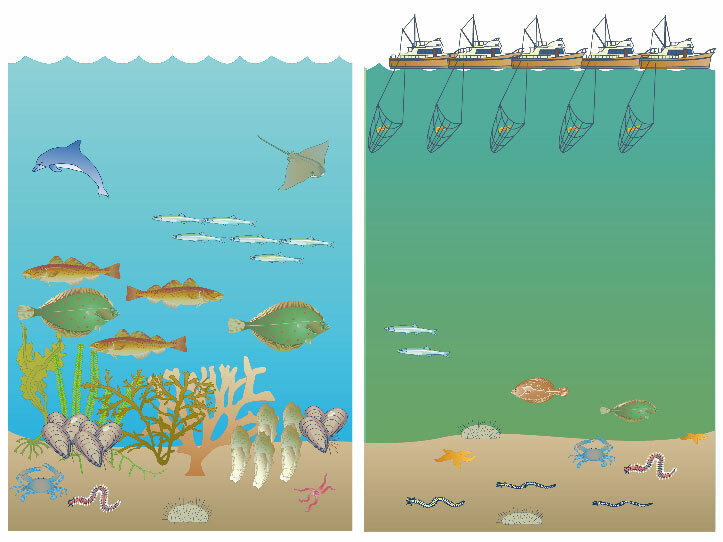 What would happen if we were able to restore the benthic community to its pre-industrialized trawling state? What societal sacrifices would restoration entail? In other words, if restoration is possible, would it be worth it? Two extreme scenarios were constructed to address these questions: the ‘Then’ vision of the North Sea, based on ecosystem functioning prior to degradation and the ‘Now’ vision, representing the current state of the North Sea ecosystem. The elaboration of contrasting visions allows exploration of the choice society faces in choosing for a particular environmental status of the North Sea. Benefits from the Then vision come from restoration of ecosystem resistance and resilience, and their support for continued supply of ecosystem services, including higher demersal biodiversity. Achievement of these benefits would be offset by societal costs. Because trawling caused loss of benthic functioning, ecosystem restoration requires restraints on this activity. Alternative fishing techniques and/or careful delineation of trawling grounds to, for example, protect key habitats might be required. There are considerable uncertainties as to how quickly the Then vision might be realised, if it can be realised at all, and so the cost to fisheries, and therefore to society, is difficult to estimate. The Then vision involves a large marine ecosystem experiment that could take decades with few, if any, intermediate criteria for assessing progress. Even though Then vision is uncertain, it is vital to current discussions on Good Environmental Status. The Then vision provides perspective on what a relatively undisturbed state of the southern North Sea might be. As a long-term goal, it would give focus for specification of GES, whether or not targets are achieved by 2020. Sea-wide degradation of the southern North Sea was triggered by industrial trawling. While now subject to a wider diversity of anthropogenic pressures, any discussion of GES, any measure to achieve it, is moot if the issue of trawling regulation is not tackled. GES is, ultimately, a societal choice. Society may choose for a status that is little different from the Now vision because the uncertainties of achieving better may not be financially ‘worth it’. This Now vision, however, maintains the southern North Sea as a turbid fishpond producing flatfish, and carries the risk of further state changes that could threaten supply of ecosystem services as a result of poor resistance and resilience. Realistically, the choice is not simply between Now or Then as there are potentially any number of intermediates, although it is entirely possible that Now and Then broadly describe two relatively stable states so that small interventions (e.g. further decreases in anthropogenic nutrient loading) would have only marginal benefits. The effects of climate change have also been ignored here, but will in reality play a key role in shaping the specificities of either vision. A choice for the Now vision, which depends on the Boreal species of cod and plaice, also carries uncertainties about future delivery of food production services. The Then vision could therefore widen our choices given the uncertain future of fish stocks. The effects of past and present pressures on ecosystems generate considerable uncertainty about setting and reaching targets for GES. This contrasting of two visions is intended to stimulate debate about the kind of North Sea society wants. Whatever vision emerges will need to be robust in the light of foreseen and unforeseen pressures from an increasingly globalised North Sea. Gilbert, A.J., McQuatters-Gollop, A., Langmead, O., Mee, L., Vermaat, J., 2015. Visions for the North Sea: the societal dilemma of specifying good environmental status. Ambio. Vol 44, pp 142-153 Open Access.